You will immediately notice a key difference in GlobalSearch 4.5, with its newly re-designed web interface. The convenience of the modern browser and the features you know and love in the desktop client are combined to provide a completely new experience. The pragmatic simplicity of a table-style look and feel, lends itself beautifully to a workspace that’s designed for optimal user efficiency. 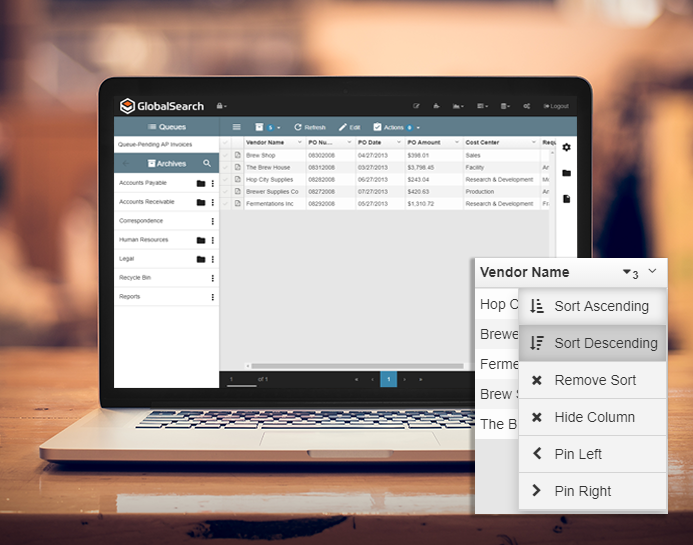 With an intuitive new table presentation of your stored content, GlobalSearch 4.5 allows you to perform all common actions from an easily understood display of information. Simply hover over a transaction and see a thumbnail preview of your record. Need to make a quick change to how a record is filed? No problem. With the proper permissions, the information presented is fully editable, right from the table. You can even update multiple records at once with a quick search and replace feature. 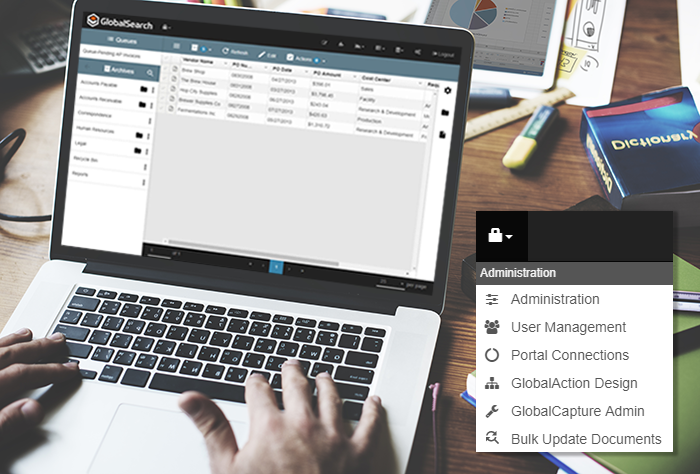 GlobalSearch 4.5 brings the Global Suite of products into a single platform that's available within an administrator's portal. This makes configuring and supporting all aspects of your Square 9 content management platform easier than ever, regardless of whether it's GlobalSearch®, GlobalCapture®, or GlobalAction®. Expanding on our powerful Extensions platform to deliver new functionality to the user community like never before, GlobalSearch 4.5 brings desktop performance to the web so you can call on local resources as needed. Migrating from a legacy system or outsourcing your document scanning? We've got it handled! You can now import data and documents quickly and easily through the browser in GlobalSearch 4.5. Launch content from the browser directly to any desktop application including Word®, Excel®, Outlook®, or PowerPoint®. Or create your own custom launch table to open records in the application of your choice. Sharing information through email has never been easier as GlobalSearch now connects with your local email client. Attach and send documents as you would within our desktop client, but now made better in the web. The reality is that employees get married and change their last names, and customers or vendors get sold, changing their names as well. You can now bulk update groups of records to quickly and easily accommodate the changes life presents. Ever have a receipt presented through the web that you need to save for your records in GlobalSearch? Or maybe you just want to save a report you’re viewing. With the new GlobalSearch PDF Print Driver you can print anything from anywhere - directly to GlobalSearch. 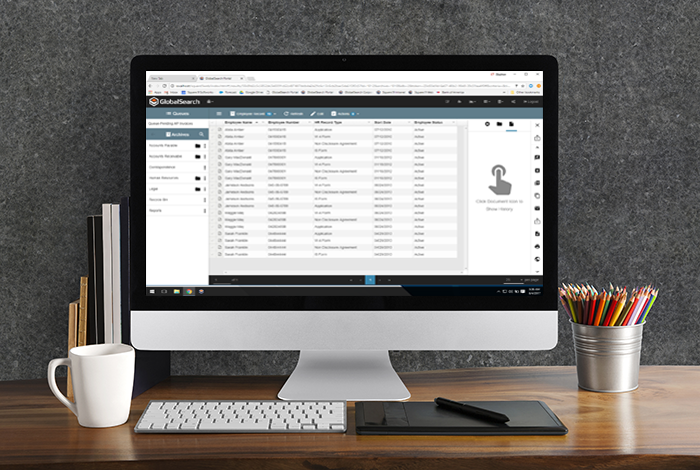 Looking to automate the flow of captured information into QuickBooks so you can create customer invoices or vendor bills without additional data entry? 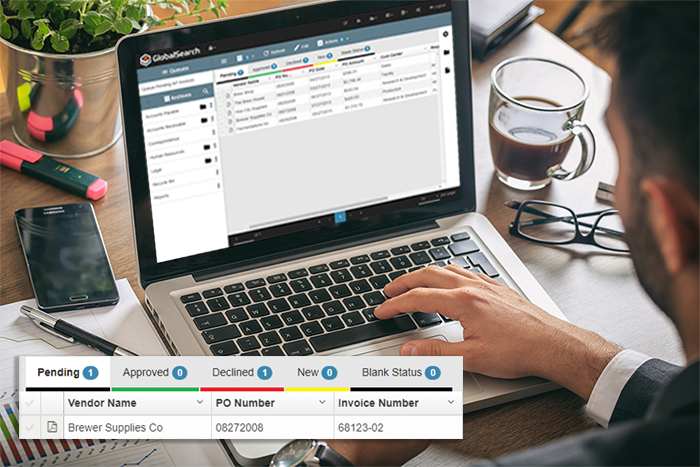 Square 9's QuickBill Extension works to make QuickBooks transaction creation both quick and easy. Are you ready to get started? Learn all there is to know about GlobalSearch 4.5 with easy access to the latest release information and technical documentation. Everything you need to know from User Guides, administrator information, release updates and more. Explore a modern, new display of technical information - experienced, updated, and accessed in real time. Familiarize yourself with all aspects of the browser client, including newly enhanced features and functionality. Upgrade to GlobalSearch 4.5 Today!